Looking for a basic hot tub maintenance guide? Firstly, If you are new to the hot tub world. You need refreshing as you have not used your hot tub in a while. If you are having problems with your hot tub water. You are thinking of getting a hot tub and wonder about basic hot tub maintenance. 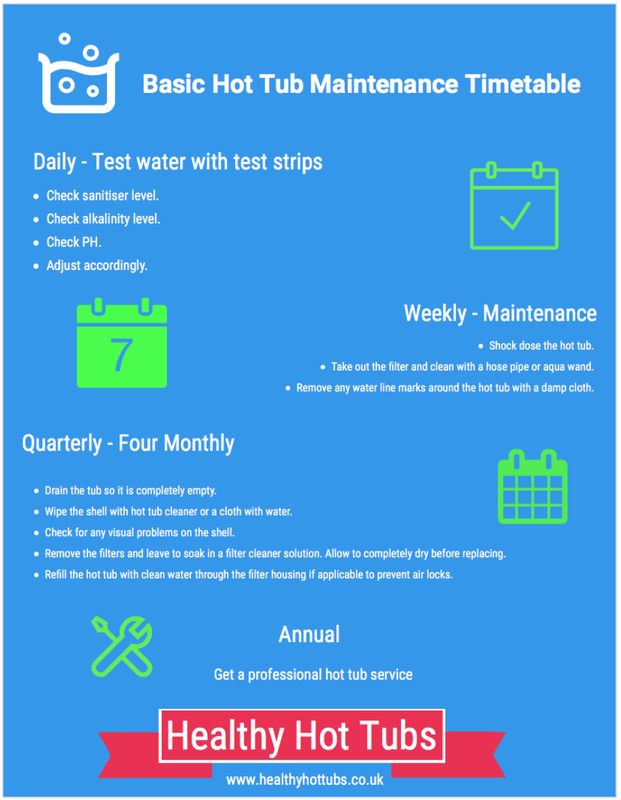 Healthy hot tubs basic hot tub maintenance infographic will help. Why you should have a maintenance schedule. It is essential for all hot tub users to have a basic grasp on maintenance. Not only will this stop anything nasty growing in the pipes of the hot tub and becoming a massive problem over time. It will also keep your hot tub in good condition. We have all heard of legionella and this is one of the dangers of not looking after your hot tub correctly. In addition it is important to note the guide above is just a basic guide and there are many more reasons why you would want to change your water more regular, such as if you were having issues with foam, cloudiness or the water has gone stale. In most cases adding a no foam or clarifier is just masking the cause of the original issue. So in such cases we always advise to shock the tub, empty, clean and restart with fresh water. Finally if you are unsure on anything to do with hot tub water chemistry? give Healthy Hot Tubs a call on 0333 7720082. Furthermore you can also contact us by email either using the contact form or sending your question to info@healthyhottubs.co.uk. In conclusion we are always here to help and there is no charge for advice, we love to help. For more information on hot tub maintenance and service contracts, repairs, servicing or advice, Contact Healthy Hot Tubs on 03337720082 or alternatively email us at info@healthyhottubs.co.uk for more information. We can tailor any of our contracts to your needs.